This month the day for our Bird Walk fell on the hottest, most humid day of the current hot spell. Birding in a sauna. Oppressive weather combined with the holiday weekend limited the number of birders who joined our walk. Even Doug Bloom did not show up, first walk he has missed in ten years. But the birders who did participate were treated to some great views. Not a large number of species, but good looks. Quality over quantity. 1. Avril Armstrong came with inches of stepping on a Killdeer nest containing both mom and 4 little eggs. 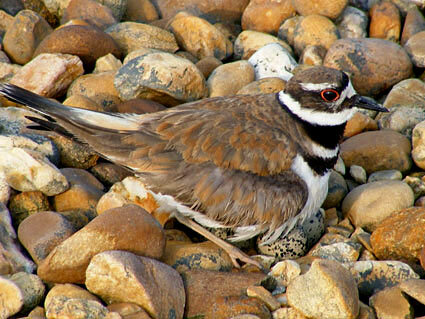 The Killdeer sat motionless until Avril was within foot and then let out a loud, high-pitched screech. As we all gathered around to gawk and take pictures, the bird stood guard screaming and defending her nest. 2. Not quite so pleasant, we watched a Herring Gull eat a duckling – a young Wood Duck, we think. Don’t know if the gull actually killed the duckling or just found the body and ate it. 3. As we watched a flock of Cedar Waxwings flitting around on the island in the river, we got a good view of huge snapping turtles. 4. At least three Green Herons in three different locations posed motionless allowing everyone to get a good view. Canada Goose, Wood Duck, Mallard, Killdeer, Green Heron, Yellow Warbler, Cedar Waxwing, Red-winged Blackbirds, Starling, Robin, Chickadee, Catbird, Barn Swallow, Herring Gull, Mourning Dove. In total, we only tallied 15 species, missing many of the common birds. But we were rewarded with some sightings we will remember.